The changes for the 2019 model of the Honda Fit are subtle yet important ones. There are no major exterior changes, other than swapping out the standard White Orchid Pearl paint color with the similar sounding Platinum Pearl White. The only other change is an addition to this car's incredible safety record. The innovative suite of safety features called Honda Sensing now includes automatic high beams. You can see any of the features mentioned below by visiting Vandergriff Honda today! The Fit has four trim levels and as you might expect from a sub-compact, the big differences mostly center around added features instead of performance upgrades. 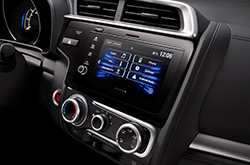 The base trim package Fit LX includes a multi-function center console with a 5.0-inch color LCD screen, hands-free connectivity, automatic on and off headlights, a 160-watt stereo with four speakers and a multi-angle rearview camera. The Fit Sports trim level bumps up the extras substantially with a 7.0-inch touchscreen with integrated Apple CarPlay and Android Auto, a full set of spoilers on the bottom, rear and sides, and 16-inch black alloy wheels. 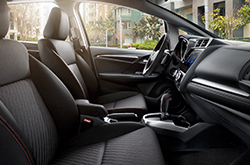 The EX trim level adds the Honda Sensing safety suite, a push-button keyless remote start, Apple AutoPlay and Android Auto connectivity, a 180-watt stereo with six speakers, a high-resolution 7.0-inch touchscreen and a stylish one-touch power moonroof. The top-of-the-line EX-L adds an optional satellite navigation system, heated and adjustable front side mirrors, heated front seats and a leather-trimmed interior. The Fit manages a 0-60 mph in a decent 8.4 seconds, which is an impressive performance for an engine that only boasts 130 horsepower. All four trim levels share the similar 1.5 4-cylinder engine, which produces 114 lb-ft of torque when ordered with the optional six-speed manual. The 2019 Honda Fit managed an EPA-rated 33/40 city/highway when ordered in the LX trim and 31/36 in Sport, EX, and EX-L trims. The Fit comes standard with an automatic transmission, but all four trim levels can optionally be fitted with a standard manual transmission along with a special clutch package. Does the Honda Fit Have Honda Sensing? 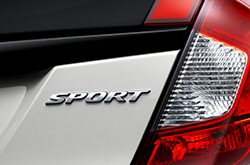 Honda Sensing is optional on the LX and Sport levels of trim and standard on the EX and EX-L trim levels. Honda Sensing includes features such as pedestrian detection, adaptive cruise control, automatic high beams, pedestrian detection, forward collision warnings, rear camera package, adaptive cruise control, auto braking technology as well as lane departure and road departure assist systems. 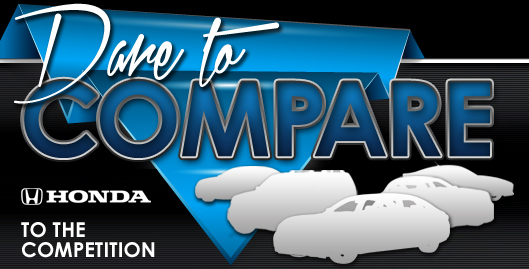 For more information, stop by Vandergriff Honda in Arlington and test drive your next car today!